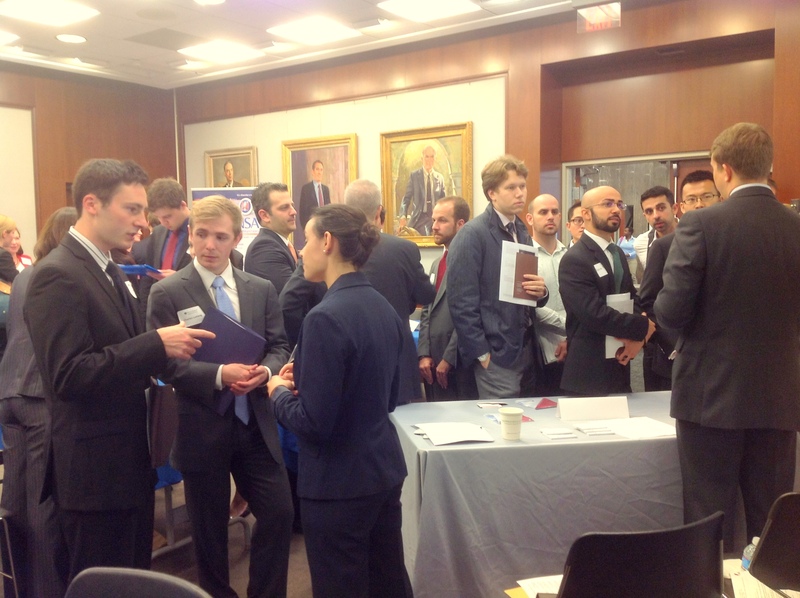 THE Kenney Auditorium was abuzz Friday, October 11 in anticipation of the Fall Career Fair. The prospect of jobs, networking and smooth elevator pitches awaited many students for the three-hour event. The fair, which took place from 12:30 p.m. to 3:30 p.m., provided an opportunity for students to learn more about employers, network with SAIS alumni and expand their professional networks. The fair boasted a “full house” with over thirty organizations in attendance. Many organizations involved with SAIS’ Nonprofit Leadership Development Initiative (NLDI) were present to share information about opportunities in the nonprofit sector. To the relief of many SAISers, most federal agencies were present despite the government shutdown. Many students commented that the best part of the fall career fair was the opportunity to learn more about a variety of employers – especially boutique firms that offer a more precise fit for students with specific interests. From development to defense consulting, financial advisors to think tanks, the range of employers captured the array of opportunities open to students after graduation. For many SAIS alumni, the fair was a homecoming. Organizations represented by SAIS alumni sought to recruit students and offer information about current and future opportunities. More importantly, “the career fair offers the opportunity for students to expand their professional networks,” said Jean-Amiel Jourdan, Senior Associate Director of Career Services. The career fair “is a unique opportunity to have multiple informational interviews with various professionals from employers of choice,” Jean-Amiel said. For both graduates and current students, career fairs also provide an opportunity for camaraderie and networking. According to Career Services, students are able to make connections with someone who knows firsthand the rigors of a SAIS degree, and graduates can share how SAIS prepared them for the work they do today. “Planning for the fair begins as early as four months from the actual date when invitations are sent out,” said Janet Burrowes, Associate Director for Employer Relations. Employers of choice were tallied from student evaluations and then invited to attend the fair. The reputation of SAIS and its students, according to Career Services, means openings for the fair fill up quickly as employers jump at the chance to offer SAIS students information about their work, their culture and career opportunities. After the fair, “employers were impressed with the caliber of the students and the questions regarding their organizations and opportunities,” said Burrowes. Although many students use the fair to learn more about career opportunities in various sectors, some convert networking into positions. Kaelyn Lowmaster, who will graduate this December, made a key connection at the career fair that directly resulted in a networking contact and a submitted application for full-time employment. As a follow-up to the career fair, the Career Services office sent out information on how to capitalize on contacts made at the fair. Students should send a brief email thanking the employers they met for attending the fair and expressing further interest in employment. Students should also attach their resume and note a specific opportunity of interest to guide the networking relationship. Career Services also offers two guides in SAISWorks to help students navigate networking and following-up: the “Networking” Guide and the guide to “Effective Cover Letters, Email, and Thank You Letters.” Prompt and refined follow-up can boost a student’s professional network and keep a student at the top of a preferred employer’s mind for any upcoming positions. In the spring, Career Services offers the popular “Perfect Pitch” event, a session which trains students on how to present a personal statement and draws over fifty employers. In the meantime, students can take advantage of Career Treks, guest speaker presentations, career panels and career workshops to help guide their thinking on career opportunities.